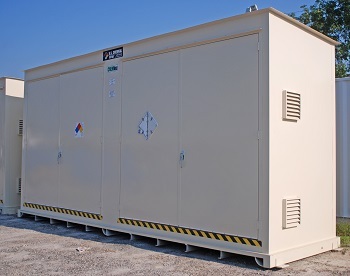 Lithium battery storage building designed and manufactured for safety, security and compliance. Lithium based batteries power many different technologies in various industries. Lithium batteries offer features such as lightweight, powerful, long-lasting and are environmentally safer than alternatives. However, lithium batteries generate large amounts of energy and the risk of a fire or explosion associated with them is generally high. The hazards associated with lithium batteries present challenges to manufacturers and industries who store these powerful energy tools. Find out about lithium battery hazards and learn about the benefits of a safe lithium battery storage building below. Lithium batteries are capable of spontaneous ignition and explosion due to overheating. Overheating can be caused by poor design, mechanical damage, overcharging, electrical shorting, rapid discharge and other causes. How to protect against potential hazards? Proper planning, risk assessment and storage methods can eliminate possible risks associated with the storage of lithium batteries. Storage methods should be analyzed based on the volume of inventory being stored, the power of each lithium battery, and the geographic region at which they are being stored at. Keep lithium battery storage maintained with proper climate control accessories and mechanical ventilation systems. Temperature controlled lithium battery storage buildings can eliminate temperature extremes, which can prevent fire or explosion hazards. Lithium battery storage buildings are professionally engineered to store lithium batteries safely. These customized buildings are commonly designed with climate controlled cooling systems, shelving, racks, explosion proof lighting, and exhaust fans. Fire-rated construction is available to compliantly store inventory nearby or even inside facilities. Increase operational efficiencies by storing inventory closer to your operations with a fire-rated lithium battery storage building. Contact US Chemical Storage online or call 888-294-2729 to learn more about lithium battery storage solutions. To learn more about safe compressed gas cylinder storage, visit US Chemical Storage online or call 888-294-2729 to receive a free quote.